Joining me on my Celina, TN area trip in September of 2003 was Tom Heffernan and his son Thomas Heffernan. We made two trips, the first being a "scouting" trip to check out possible camping areas and ramp conditions, as well as to check out Tom's new Buick. The next trip was to camp, fish, and cruise the areas waters. We took my Ford 150 pulling the "Blue Heron", an 18' MonArk Aluminum Jon Boat with a camper top on it, and packed the cabin full of camping & fishing gear. Weather was a definite factor, but we decided to take the chance anyway, due to other commitments on our time. The trip to Celina was a beautiful drive, and we decided to stop at the mouth of the "Roaring River" to fish that evening before continuing to the campsite. The Roaring river joins the Cumberland at CRM 357.8. The ramp was great, and so was the fishing. Tom & his son fished from the front deck, sitting atop the bench seat I had built over the front 20 gallon fuel tank. It worked well for fishing. Later in the day, we ventured onto the Cumberland and headed upstream. As I attempted to "get on plane", it was obvious that either Tom or his son would need to move from the front deck to the seat behind the cabin. This allowed us to "plane off", but with both fuel tanks full (38 gallons), and all our camping gear and provisions still in the cabin, it was quite a load for the 50 hp Johnson outboard to push! 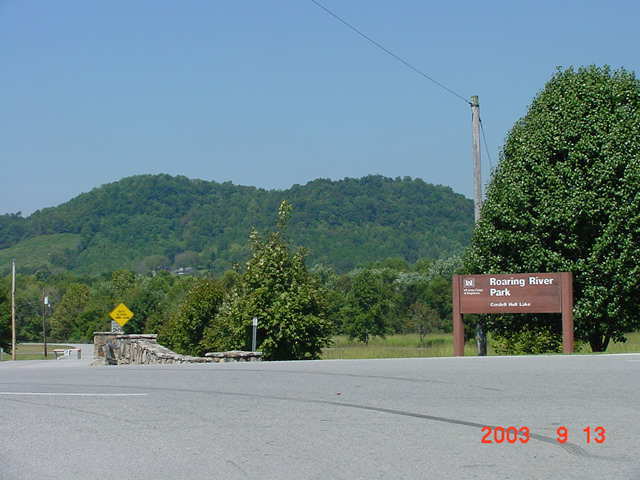 The three of us pulled into the campground located on the Obey River about 1/4 mile below Dale Hollow Dam. Dale Hollow Lake , home of the "World's Record Smallmouth Bass" is a destination in itself, but the purpose of this trip was to explore the Roaring, Obey, and Upper Cumberlamd rivers, all part of the C.O.E. Cordell Hull Lake impoundment. We set up a tent and portable cots for the Heffernans and I slept in the boat cabin. On the water, the boat cabin sleeps good, but it was not level and I had to switch positions to get any sleep. Remember, I had mentioned the weather might be a factor on this trip? It rained, HARD, all night long and till nearly 11 o'clock the next morning. We managed to string a tarp in order to cook breakfast, but it was still a very messy affair. When the rain stopped, we decided to try and dry things out, and unhooked the boat and went to see the sights of Celina. With the rivers "up and muddy", we decided to cancel the planned fishing for that day and just head on back home. Still a good trip, but could have been an even better one if weather and our time commitments had allowed. Lots of pics of the area to see.